The Walk Ons radiate a confidence that, despite their easy-going rock sensibilities, feels raw and unrestrained. 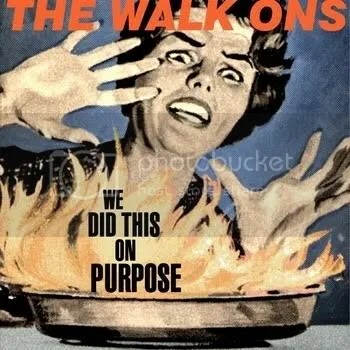 Their EP, “We Did This On Purpose”, feel anthemic, yet there are a couple of tracks that feel like they lag behind. The Walk Ons are without a doubt one of those “fun” bands. One of those bands where you can just imagine them having fun playing this stuff live. So after opener “Forget You” launches the EP into a brilliant start, to see it drop back a notch and let up in terms of pace is a small disappointment. Those agile lead guitar hooks just don’t return until “State of Affairs”, and they should probably have returned much earlier. Not to say that the songs on the EP are a disappointment in themselves, but after getting so excited and pumped up from an opening track, it takes a bit of adjustment. Luckily the EP does pick itself up in these respects. “State of Affairs” feels like it brings back this hooky energy, and closer “Ready to Leave” races to finish it all up, without feeling rushed. All up, it’s a solid EP, despite what seems like a drop in “fun factor” on a couple of tracks. A lot of bands try to expand their sound and move it about, and often fail at doing so. The Walk Ons stick to their guns, and it shows. Their brand of unashamedly fun rock is strong, and they know what they’re doing and where they’re going. I feel like if they just pick up the pace on a couple of songs, and refine their style, they’ll have nailed something special. And I’m more than sure that this will come with time. Grab a free download of “Forget You” here.